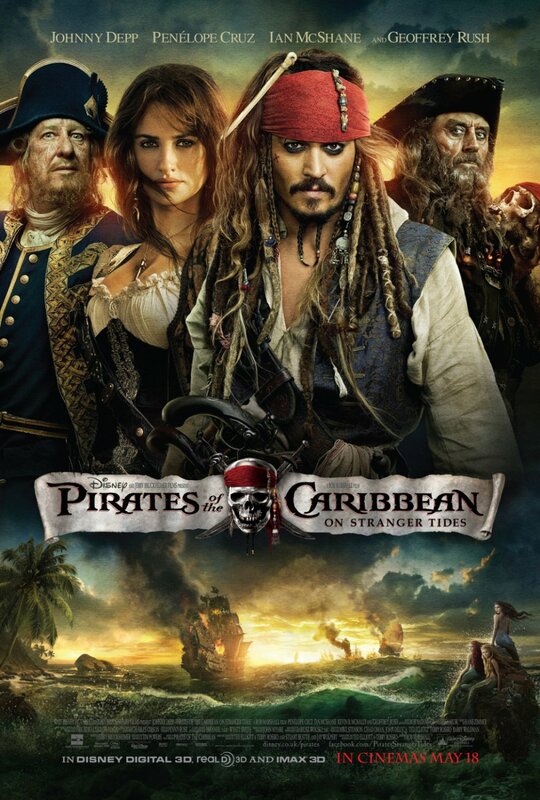 Movie: "Pirates of the Caribbean: On Stranger Tides"
The Spanish Navy, the pirate Blackbeard, who has taken Jack Sparrow hostage to use as a guide, and a now British Crown privateer Captain Barbossa, all race to find the fountain of youth. "Pirates of the Caribbean: On Stranger Tide" is the fourth film in the "Pirates of the Caribbean" franchise. This time around and for the first time in franchise history, Rob Marshall takes over the directorial duties from Gore Verbinski, who had directed the previous three movies. Marshall isn't exactly known for directing action adventure movies as the majority of his features are musicals, such as "Chicago," "Nine," and "Into the Woods." Verbinski isn't the only one absent as many of the actors from the original cast is gone as well, with the exception of Johnny Depp as Jack Sparrow, Geoffrey Rush as Barbossa, and Kevin McNally as Gibbs. New to the cast are Ian McShane as the dreaded pirate Blackbeard, captain of the Queen Anne's Revenge; Penelope Cruz as Blackbeard's daughter Angelica, who is the closest thing Jack Sparrow has ever had to a love interest; Sam Claflin as the devout missionary Philip Swift, now captive of Blackbeard's; and Astrid Bergès-Frisbey, who plays a mermaid named Syrene. Barbossa, who is now a privateer for Britain, Blackbeard, and the Spanish Navy, who are a bunch of unnamed characters that spend their entire screen tie as fleeting glimpses in the background, all race to see who can get to the fountain of youth first. Ahoy, mateys, Jack Sparrow is back and in another adventure...but why?! Disney figured they could squeeze some more money out of this dwindling franchise, so after a four year break, the Pirates are back!...well, not the director or most of the cast, of course, but hey, Johnny Depp is here and he gets to dress as a pirate and act bizarre and goofy, and that's really what the people want anyway!!?? With most the cast absent, the writers of this fourth film are left introducing new characters and villains to fill the vast void. Unlike the baddies from the previous films, Blackbeard as a villain isn't interesting in the slightest and feels rather disposable. It is kind of cool that Blackbeard has a magical sword that controls his ship, but away from his ship, he becomes the least threatening villain of the series, which is a damn shame because Ian McShane is brilliant and completely wasted. This installment is, however, a return to form in other manners of speaking, with big sword fights that travel across an entire room, a magical voodoo ship with a zombie crew, and every character running a different gambit from movie's beginning to movie's end. Despite the massive budget of "Pirates of the Caribbean: On Stranger Tides," it feels quite scaled back and wholly lackluster with very low stakes. There is a real issue with character development, and we wind up caring very little for any of the new people introduced here. There is still a fun moment or two and a little entertainment to be had, but this fourth film is definitely a step down from the previous three. Stop at the third movie and never look forward.